We have had a very full and busy day. Our class sizes are growing each day, a true blessing to meet each student. Many of the grade nine students were writing exams this week and missed the first few days. The level 1 class is now up to 12 and the level 2 has 10. We will teach tomorrow but our numbers will be down again as not everyone is able to attend on Saturday. We are pleased that the students are very receptive to not only the English classes but also the bible lessons that we are leading. We were asked to stop by the clinic after our long morning of teaching. Nurse Kathleen and the other clinic staff planned, prepared and hosted a celebration lunch to honor Ms. Marilyn. Many speeches, hugs, kisses and prayers! Marilyn was presented with a commemorative plaque. 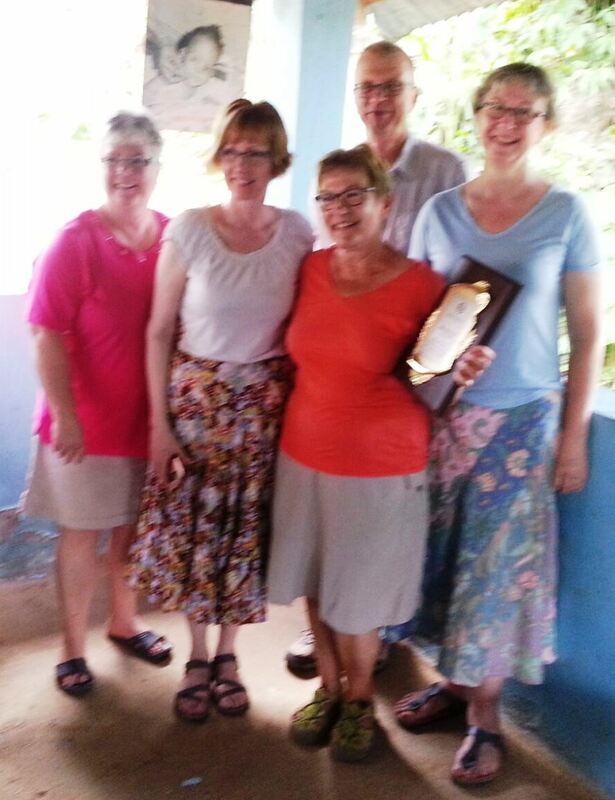 Our team and Albright church were also recognized and thanked for our years of support and encouragement. After prepping our lessons and doing journals and conversation circles we were looking forward to a relaxing evening but the clinic staff stopped by for an evening visit, much fellowship and laughter ensued; so different from our first visit many years ago. Such a blessing that long term relationships are being built.